You are here: Home / Uncategorized / A simple offer – $400 cash if we can’t help. WHAT? : If we can’t save you money on your mortgage we will give you $400 cash. HOW? : Attend a “Mortgage Review and Rewrite” (“MR&R”) appointment with The Wealth Centre and we will calculate the figures. WHO? : Anyone who has a mortgage with one of the Big 4 banks can apply for the MR&R offer. COST? : Nothing. That’s right – the MR&R appointments are free. We’re paid by the banks over the lifetime of your mortgage – not by you. It literally couldn’t get any better. PROOF? : Still not convinced you need to book this appointment? I can tell you that one of our MR&R clients has just saved $134,649 on their mortgage. That is 6 years off their mortgage payments. This client has a $375,00 mortgage over 30 years. NOW WHAT? : Want try for the $400 cash or better still the saving on your mortgage? Simply email us here or call on 1300 132 648 and ask for an Mortgage Review Appointment. We’ll contact you within 2 business days and arrange a time to meet that suits you. BONUS: MR&R appointments also earn you five extra tickets in the $1 Million draw. And let’s face it if you win the $1 Million you won’t have to worry about a mortgage – ever again! BUT I don’t have a mortgage with one of the Big 4? That’s okay come in and see us. 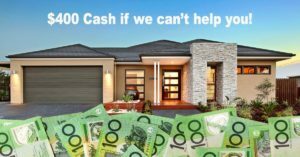 You don‘t qualify for the $400 cash offer BUT it is highly likely we will be able to save you money on your mortgage and you still get your 5 extra tickets in the $1 Million draw. The MR&R $400 cash offer is available now. The MR&R appointments are free. No silly ‘limit’ on the number of appointments we’ll book but it will be on a first in best dressed basis. You will receive five extra tickets in the $1 Million draw drawn in December 2016.